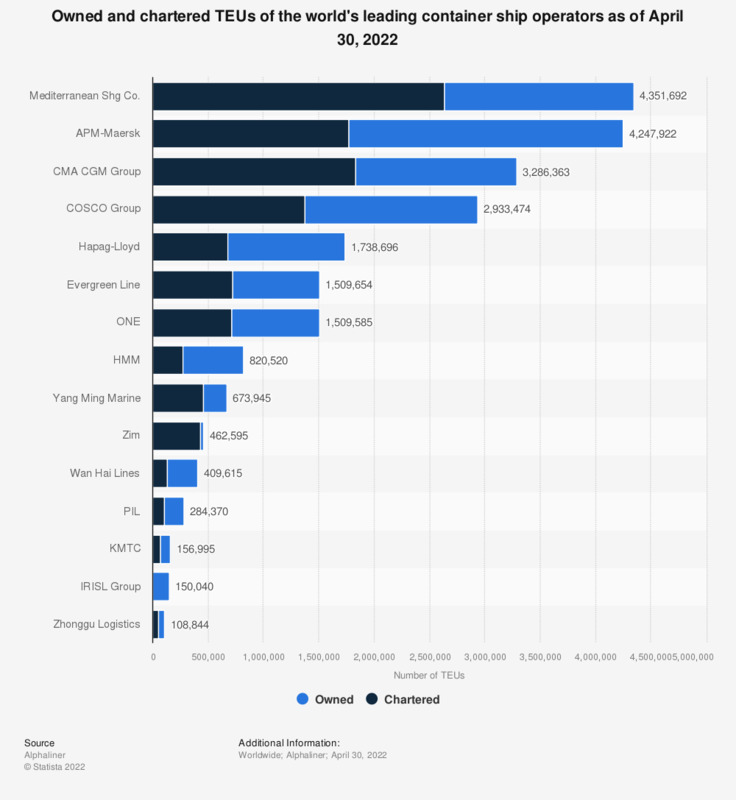 This statistic displays a ranking of the world’s leading container ship operators as of March 27, 2019, based on TEUs. With around four million TEUs overall, APM-Maersk was ranked first. A.P. Moller - Maersk Group is a Danish business conglomerate. It has activities in different business sectors, mainly within the transportation and energy sectors. In 1996, it first topped the list of the world's largest container ship operators. A.P. Moller - Maersk Group's largest business area is container shipping and related activities. It comprises: worldwide container services, logistics, and forwarding solutions as well as terminal activities which are in the brand names of Maersk Line, Safmarine, and Damco. A.P. Moller - Maersk Group is headquartered in Copenhagen, Denmark. It has subsidiaries and offices in 130 countries around the world and a total headcount of about 75,813.